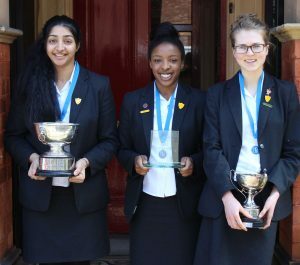 A team of Red House School pupils represented the region at the National finals of the ESU (English Speaking Union) Public Speaking competition held at Cambridge University. The team, made up of Nathania, Aditi and Olivia, all performed exceptionally well and Nathania was announced the winner of the Best Speaker at the finals, making her the Best Speaker in the country! Nathania spoke on the topic of philosophy and its place in the modern world, with her speech clearly declaring that philosophy still has a firm place. Aditi took on the role as Chairperson and Olivia as Questioner on the topic ‘social media is making us anything but sociable’. Each role had its own skills and was demanding in different ways. The role of the Chairperson was to introduce the Speaker and their topic, call on the Questioner and the audience members to put questions to the Speaker and summarise the overall presentation as part of their conclusion. The role of the Questioner was to ask probing questions with a view to eliciting more information from the Speaker and expanding the discussion as a whole. The ESU Public Speaking competition develops not only the pupils knowledge of topical issues but enhances their speech writing skills, their speaking and presentation skills and their ability to think analytically on their feet, as well as developing confidence. 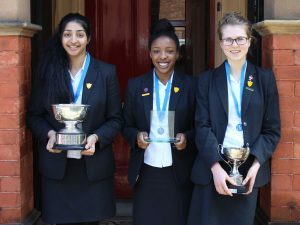 “We are extremely proud of Nathania, Aditi and Olivia in reaching the finals of this prestigious competition. 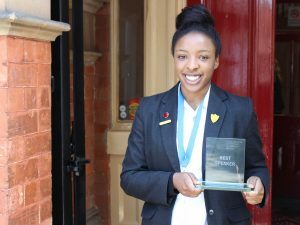 We are delighted that Nathania has been awarded the Best Speaker in the country, it is an outstanding achievement. We consistently perform very well in public speaking and this is the second year running that we have reached the finals of the ESU competition. Nathania also gained success earlier this year by competing in the finals of the National Poetry by Heart competition. At Red House we encourage pupils to excel in all aspects of school life. We provide a wide variety of opportunities for children to develop their individual gifts, talents, skills and knowledge so that they become confident individuals. This begins at a very early age in the Nursery & Infants School and continues all the way through to the Prep & Senior School. Children actively participate in school assemblies, give readings in church and undertake performances in school. Through these regular activities, accompanied with the unique family atmosphere at Red House, children are able to develop their confidence”.